I believe that every nation has a soul, and that this ‘soul’ is often expressed through the culture of its people. Some may argue that the culture of a nation has nothing to do with its soul, and everything to do with the artists behind it. This approach may be correct, but it does not appeal to the romantic in me! Therefore, whenever I travel to new places, I often turn to the arts in my quest for an understanding of the elusive spiritual side that a nation may have. Venezuela was no different: If I was at a theatre watching a play, in the streets, listening to original music of local people, or at an evening of Venezuelan folk music (none of which I truly understood much in the end), I always paid careful attention to the artistic expression of the heart/soul of the nation. But it was not in the capital of Caracas that I finally had a taste of the real soul of the country, but in the village of Guasdualito. What helped enhance my experience was that when I arrived there, preparations had started for a very important celebration for the people in this part of the world: July 16th, the feast of Our Lady of Mount Carmel (La virgin del Carmen), the patron saint of Guasdualito. Throughout the entire week I was there, I basically went around with one of the thee priests to celebrate masses or a prayer service at various houses where people were 'hosting' our Lady. After a week of preparations, on the 16th, the big celebration reached its climax: Our day started with a boat ride across the lake, as we carried the statue of our Lady to the house of one of the parishioners. ‘Sounds quaint’ you say? It wasn’t. It was epic! Picture the scene: It's 7:00 am, there's about fifty people cramming into five rather long motor-boats. Most of the boats were decked with colourful balloons and flowers. 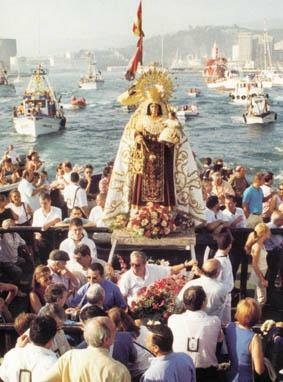 But our boat was the most interesting, as we were carrying the statue, we had all three priests, all the altar servers, two girls dressed up as Our Lady of Mount Carmel, and the only guy with a guitar! Oh, and some Canadian guy! As we went along the way, many who were working on the shore stopped their work to pray with us as we were going along; there was also a lot of singing. Our singer was amazing, and some of the other boats, when they were closer to us, rather than singing their own songs, would listen to ours. Then there were the songs of the altar servers: our boat had all the people on one side, the Statue in the middle, and then the girls dressed up as Mary, and the Alter servers on the other side. They couldn't always hear the songs the adults were singing, so at one point, they started singing their own songs. I was quite moved by that. These kids had their own devotion to Mary going on. Since I didn't know most of the words to these songs, I enjoyed listening to the two different groups singing different songs. Many people may have found this chaotic; I thought it was festive, and spiritually uplifting. Our Lady was getting a lot of love from these people that day! I feel like she was returning it too. And if such a deep expression of love is not also an expression of the country’s soul, I truly don’t know what is!